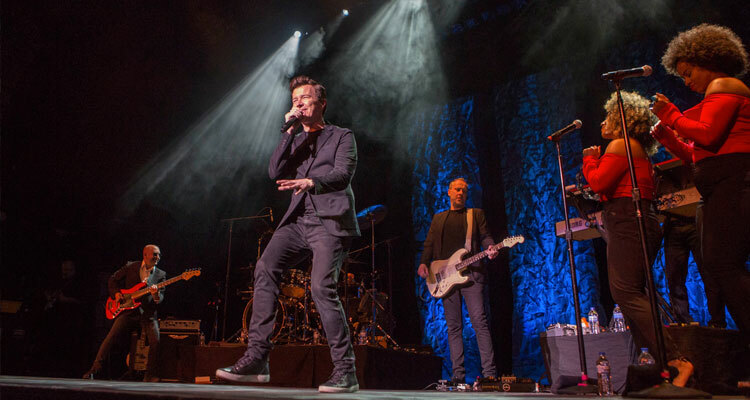 Best known for his late 1980s dance-pop hits “Never Gonna Give You Up,” “Together Forever,” and “Whenever You Need Somebody,” English singer and songwriter Rick Astley and his talented six-piece band brought those hits and newer ones to the Pabst Theater Thursday night. “I love drumming. Besides singing, it’s my favorite thing to do,” Astley revealed to the crowd. He also adopted a “when-in-Rome” attitude in Brew City when he and his band imbibed a few shots of Jaegermeister about halfway through the show. “It just seems rude not to toast you, in Milwaukee, with a drink onstage. This is where the concert goes downhill,” Astley quipped. He later donated two shots to front-row audience members. Astley often encouraged the crowd to sing along to the songs louder, pointing his microphone at the audience. For the 1988 ballad, “Hold Me In Your Arms” Lauren and Stephanie were recruited to help the crowd increase their volume, asking the women to sing first, then the men. The bass player, keyboardist, and drummer provided a cohesive rhythm section, playing funk, pop, and R&B-influenced songs seamlessly. While Astley’s guitarist didn’t have many soloing opportunities, he demonstrated his chops during the “Highway To Hell” cover, and by breaking into a solo when Astley introduced the band at the end of the show. The audience, which consisted of a mix of baby boomers, Gen Xers, and millennials, sang along word-for-word, dancing in seats and holding up cell phones. Astley, a class act, was a gracious guest to the Pabst, thanking the theater crew for making him and his band comfortable. “We couldn’t have done this without you,” he said. Astley replied that he’d be back. After such an entertaining show, it was just what the crowd wanted to hear.